Even seasoned models have been known to take a spill or two on the runway. We’re only human, after all. For the fashion brands behind them, however, the onus not to stumble weighs a little heavier. With Greenpeace’s 2020 “Detox” deadline fast approaching, the environmental group decided to check in on 19 of the companies that have committed to eliminating hormone-disrupting industrial chemicals, including 11 priority groups Greenpeace has identified, from their supply chains. As the third edition of its “Detox Catwalk” reveals, not all is smooth strutting. While Greenpeace lauded Benetton, H&M, Inditex (which operates Zara) for taking concrete actions based on credible timelines, it called out several others for appearing a tad wobbly under the strobe lights. Greenpeace relied on three main criteria for its scoring. First, the group looked at each company’s chemicals-management system, in particular its Manufacturing Restricted Substances List and the methodology used to establish that list. This allows the company to “identify hazardous chemicals used in manufacturing by suppliers and set priorities for elimination with timelines,” Greenpeace explained. Next, Greenpeace assessed the brand’s progress toward stamping out the use and discharge of perfluorinated compounds. The group also took into account the company’s transparency, its disclosure of supplier lists, and whether it ensures that its suppliers regularly publish their wastewater discharge data. “Progress is to be reported by companies on their corporate website on a dedicated Detox webpage, visible and prominent, and clearly divided by criteria,” Greenpeace said. Most of the companies, including Adidas, Fast Retailing (which owns Uniqlo), G-Star Raw, Marks & Spencer, Mango, and Levi Strauss, are still in “Evolution Mode,” meaning that they need to step up their performance in at least two of the three key assessment criteria. “These companies are committed to Detox and have made progress implementing their plans, but their actions need to evolve faster to achieve the 2020 Detox goal,” Greenpeace said. At the bottom of the curve are the “Faux Pas” brands: Esprit, Limited Brands (which runs Victoria’s Secret), Li-Ning, and Nike. Although these companies originally made a Detox commitment, they are “failing to take individual responsibility for their supply chain´s hazardous chemical pollution,” Greenpeace said. 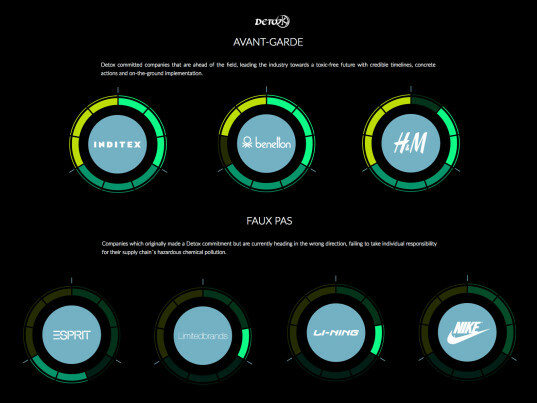 Esprit and Limited Brands, which Greenpeace called “Detox Leaders” in 2015, took the biggest tumbles in ranking, the first for “backtrack[ing] on its commitment to publish data on hazardous chemicals discharges” and the second for failing to provide evidence that it has divested itself of PFCs. Li-Ning and Nike, previously “Detox Greenwashers,” continue to receive failing grades. These dawdling brands include Dolce & Gabbana, Gap, Hermès, and Versace. Even seasoned models have been known to take a spill or two on the runway. We're only human, after all. For the fashion brands behind them, however, the onus not to stumble weighs a little heavier. With Greenpeace's 2020 "Detox" deadline fast approaching, the environmental group decided to check in on 19 of the companies that have committed to eliminating hormone-disrupting industrial chemicals, including 11�priority�groups�Greenpeace has identified, from their supply chains. As the third edition of its "Detox Catwalk" reveals, not all is smooth strutting. 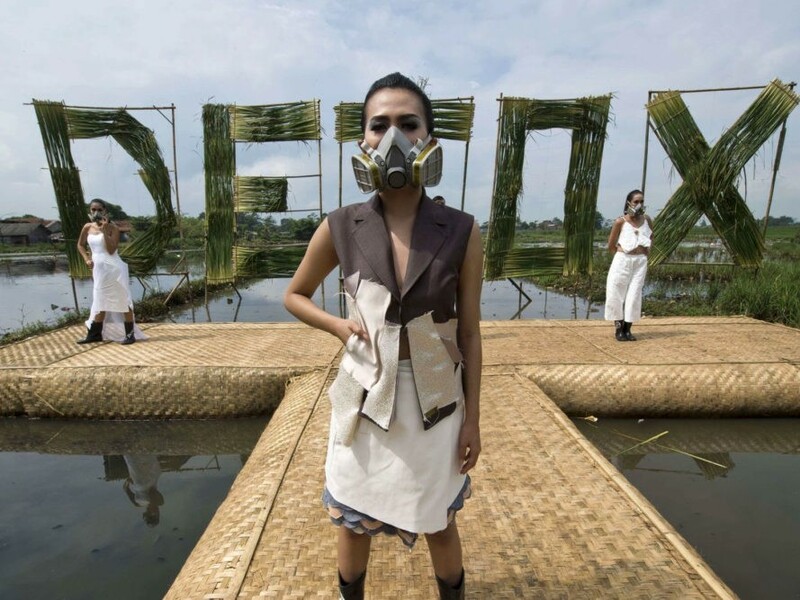 While Greenpeace lauded Benetton, H&M, Inditex (which operates Zara) for taking concrete actions based on credible timelines, it called out several others for appearing a tad wobbly under the strobe lights.